To date, users from over 80,000 individual organizations and 175 different countries employ Smartsheet in some capacity. The software’s inherent versatility has attracted a diverse customer base, including Fortune 500 companies, small businesses, start-ups, schools, universities, governmental agencies and even non-profits. Smartsheet is a flexible tool with a Excel spreadsheet-driven theme, that makes working in it just natural. If you are accustomed to Excel then it will seem rather familiar, with the two having a lot of similarities. You have total control over how a sheet looks due to conditional formatting. Also you can set reminders on due tasks, reports as well as set up alerts and automatic emails. It has common features to other project management platforms: dashboards, Gantt charts, reports and resource management. A very interesting feature that I haven’t seen much elsewhere is the possibility to create web forms to collect data: very easy to build and can be accessed from within a browser, with just a link that you share to people. I found it rather annoying that you can’t assign a task to several people at the same time. Makes for a bit of leg work. Also, time assigned to a task is on a percentage basis, where I would like to set it for a number of hours. And there is no time tracking feature to count time passed on tasks. Smartsheet has the limitations of its original concept: being based on spreadsheets, so it is not very visually attractive, and has some design limitations. The only part that is not a table is the Gantt chart. Smarthseet suffers here compared to other management software that have a more advanced UI design. This Washington-based company was launched in 2006 with the help of founders Brent R. Frei and Mark P. Mader, both ex-employees of Onyx. 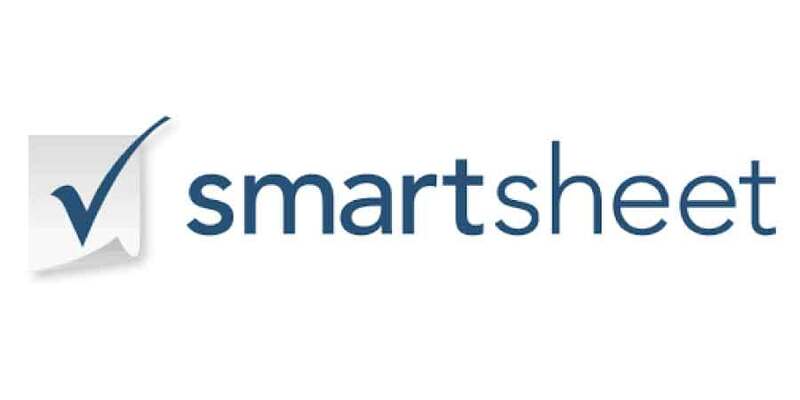 Since it’s founding, a good 10 years ago, Smarsheet has received numerous industry awards, including the 2016 Geekwire “Next Tech Titan” title. To date, users from over 80,000 individual organizations and 175 different countries employ Smartsheet in some capacity. The software’s inherent versatility has attracted a diverse customer base, including Fortune 500 companies, small businesses, start-ups, schools, universities, governmental agencies and even non-profits. Smartsheet is available in a multitude of languages like English, Russian, German, French, Japanese, Spanish and Portuguese. If it sounds like Smartsheet might be what your business needs, keep reading our review. Working in Smartsheet is simple and fast. That is a desired combination when it comes to project management. Creating a sheet is straightforward and can be done in a variety of ways. Once you are in a sheet, you can create as many columns as you like. Each column can be a text field, contact list, drop down list, checkbox, or symbol. In short, they are whatever you want them to be, which is powerful. The application is clean and highly functional. You can customize the look and feel and add a logo. Easy to navigate and you can organize your sheets in folders or work spaces. With recent updates to it’s price structure, things have gotten a little confusing. Still, you will find that pricing is reasonable. What is great about Smartsheet is that they never try to lock you in and hold you hostage. You can upgrade and downgrade at any time, without any help. They will get involved only if you want to get on an Enterprise plan. Introduced in 2013, Smarsheet’s API gives your company the ability to build custom tools on top of the platform. For example, you could build dashboards or reports that integrate data from a number of systems and tools into a single view. You could integrate with maps to visualize addresses and locations. The API is easily accessible through their developer site, and detailed documentation is available to help your team get up to speed quickly. In one sense, sharing is easy to do, and requires little effort on the part of the person receiving the sheet. However, you can only share one sheet at a time, and if you want to unshare a user, you have to do that one sheet at a time as well. A great place to learn about Smartsheet capabilities is the video list. You can also find a useful collection of articles and tutorials. If you are looking for more hands-on help, they also offer live training webinars. It will take some time and effort but it is very nice from them to make it a little bit easier. Smartsheet has excellent support and they really care about their customers. They respond quickly, no matter how you contact them. However, email seems to be the fastest way. There are a variety of features that are built into Smartsheet allowing you to use Google Docs, giving you the ability to attach to Google Docs and Google Drive. Reporting is on other lever. You can generate reports on everything across any of your sheets. Not only can you generate reports, but you can also work within reports. This is what makes a report so powerful. Bring data from dozens of sheets and work in one central location. This is just great. For example, imagine you are managing a writing team. You may have 10 different sheets for 10 different writing projects. You may have 10 writers working in 10 different sheets, but only 2 editors. It will be a pain for your editors to have to go back and forth through the 10 sheets. Instead, you can create a report for the editors, and have them work from there. Everything they would want to do in the original sheet can be done from the report. The data is then updated on both the report and the original sheet. This also includes discussions and attachments. In 2012, they have received $26M in funding from Insight Venture Partners. With that kind of money brought to an already thriving company, we expect some serious improvements and innovation to be added. and go through a series of steps. It would be great if you could just right-click it from the home screen and share it. The biggest downfall is the lack of email integration. This is an area where Smartsheet fails miserably compared to other solutions. Discussions take place within a row of a sheet. You can click on any row and form a discussion on that row. From there, you are able to set up a variety of email options. You can set it so that users are notified when a discussion or comment takes place. This is helpful, but that is where it ends. There is no further emailing capabilities. One would be the ability to send emails from within Smartsheet to specific users. The second helpful feature would be the ability to reply to an email that is sent from Smartsheet. When you reply, the message should show up on the Smartsheet discussion. These features seem like no brainers, and it is surprising that they do not exist, given the fact that some of Smartsheet’s competitors nail this functionality. Many project management solutions offer tools that help you keep track of time. This would be great for billing or expenses. But Smartsheet offers you some solutions though, not great but nonetheless available. You can create a column for tracking time. The downfall, is that there is no built-in timer. This is not a huge loss, but something worth noting. Smartsheet is a great way to move away form Excel to a more robust task management software. I believe there are better platforms for project management but if you need a mix of both task and project management, and like to work with spreadsheets, it is still a valuable option.